So I have two players in the Benny Andrew Hall of Fame, but they don’t have a team to play for. Both those players seem comfortable playing in black and yellow/gold, so for me there is only one reasonable choice. I started supporting East Fife Football Club in 1990, when as a six-year-old I was taken by my aunt and my dad to a 2-0 home win over Queen of the South one Tuesday or Wednesday evening, near the beginning of the 1990-91 season. From what I remember we played well, though I did have to keep reminding myself that yellow and black was the team I was supposed to be cheering on. The following Saturday (at least it was the following Saturday according to my memory) I witnessed a 1-1 draw at home to Arbroath in what passed for a beautiful day in Upper Methil. 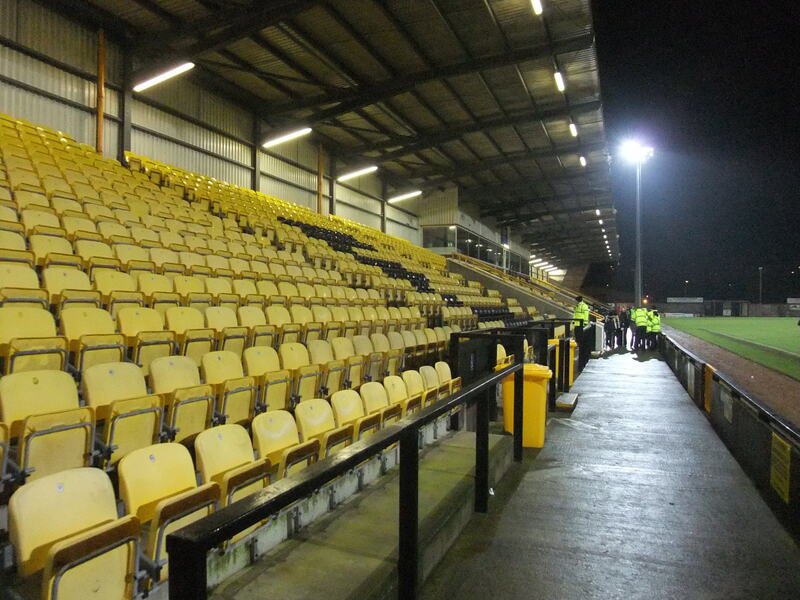 From then I was largely hooked, and though I’ve never been to more than ten or so games in any one season, East Fife became my team from that moment on, 10 minutes down the road at the much-missed old Bayview Park. Although the club currently finds itself in the bottom division of the Scottish Professional Football League, the Fife has a proud history stretching back to its founding in 1903. The first 100 years of the side’s existence are wonderfully captured in Jim Corstorphine’s “On That Windswept Plain.” Among the obvious highlights, Scottish Cup final appearances in 1927 and 1950 sandwiched an historic win in 1938, with the Fifers winning 4-2 in a replay against Kilmarnock.East Fife remain the only side outwith the top division in Scotland to win the Cup. The late 40s and early 50s were undoubtedly East Fife’s greatest years. Three League Cup wins, that 1950 Scottish Cup final appearance and two third place finishes in the league saw the Fifers briefly establish themselves as one of Scotland’s top sides. Scotland internationals like George Aitken, Davie Duncan and Henry Morris (1 cap, 3 goals) became household names. 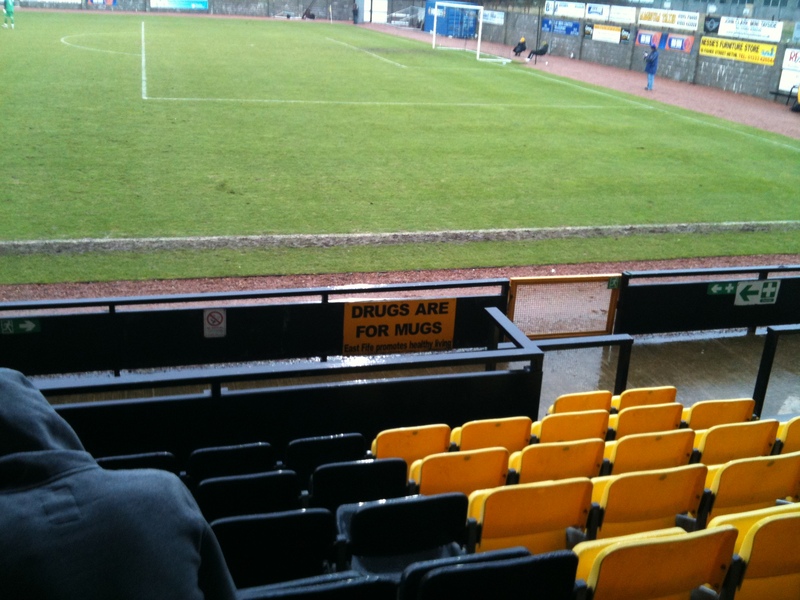 Unfortunately by the end of the 50s East Fife were back in the second tier. A brief dalliance with top tier football came again in the early 1970s, in which there were two outstanding moments. One was a 2-2 draw at home to Celtic in which Fife keeper Ernie McGarr saved two penalties as Celtic missed three – among the penalty missers was one Kenneth Dalglish. The other was a 1-0 win at Ibrox against Rangers, the Fifers’ only win in Govan, a game where the chaps from Methil were managed by kit man Alex Doig. And so back to 1990 again and the start of my affair with the Fife. There have been a fair number of highs watching East Fife over the last almost a quarter of a century, and a lot more mediocrity. Being promoted to the First Division in 1996 under Steve Archibald’s visionary management was frankly incredible. He then fell out with the board and was pushed out early in the 96-97 season – a league record of P36 W2 followed, mostly under Jimmy “Book of Excuses” Bone with a direct visit back to the Second Division to follow. That remains the only season East Fife have had in the second tier in Scotland since I became a supporter. 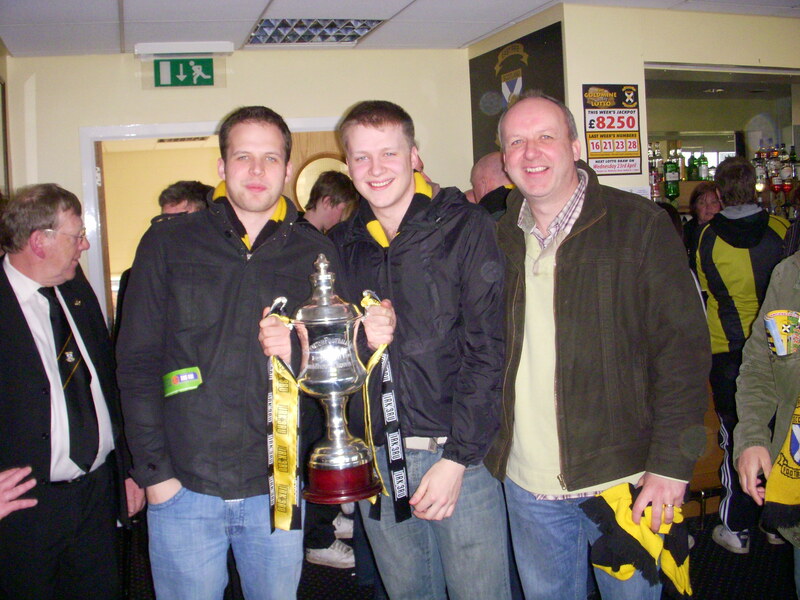 2007-08 was another landmark season – not only did I start going out with my future wife but East Fife won their first divisional title since those wondrous days in the late 40s, winning the Third Division by an absolute mile. I’ll never forget the day in March 2008 when 700-odd Fife fans crammed into East Stirlingshire’s gloriously ramshackle Firs Park to guarantee the title win. 3-0 was followed by champagne, a pitch invasion and the Shire directors very magnanimously sticking on “We Are The Champions” for us. The League Cup run of 2011-12 is also very worthy of mention. First came a 2-1 home win against Fife rivals and then-Premier League side Dunfermline Athletic. Then an epic penalty shoot out win after a 3-3 draw away in Aberdeen. The wheels eventually came off, as they so often do in life, in Kilmarnock, Welsh youngster Rob Ogleby’s red card proving decisive for the gentlemen in black and gold. These are the things that make supporting a smaller team so fantastic and so infuriating in equal measure. There are odd spurts of glory, interspersed with bouts of nothing and/or (particularly at the moment) financial issues. The gallows humour and complete lack of arrogance and hubris make the supporting experience that much more enjoyable than one of the bigger teams – we are indeed s**t and we know we are. Methil will be a big step for Lars Ricken in particular, but I reckon he can handle playing for my team.